During a comprehensive eye examination your optometrist can detect signs which could indicate various eye conditions or problems in your general health. Listed below are a just a few of the more common eye problems or conditions. If you have any questions we would be happy to answer them. Short-sightedness, or myopia, is a vision problem that causes distant objects, for example road signs, to appear blurred. Near objects can normally be seen clearly. Long-sightedness, or hypermetropia, is a sight problem affecting the ability to see near objects. People who are long-sighted can usually see better at distance but near objects appear blurred. Some long-sighted people, however, need glasses for distance as well as near. Astigmatism is very common and occurs when the front surface of the eye, the cornea, is shaped more like a rugby ball than a football. Light is focused at two separate points on the retina, rather than just one. This is causes your vision to become blurred. It can be easily corrected with prescription spectacles. Presbyopia occurs when the crystalline lens within the eye loses its ability to focus on near objects. The lens’ natural elasticity declines with age. This results in difficulty focusing on near objects. This is a normal change which usually occurs in your mid-forties. Presbyopia can be corrected in several ways including single vision reading lenses, bifocals, varifocals and in some cases contact lenses. 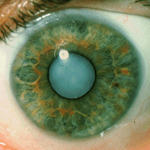 Cataracts can occur at any age but are much more common in older people. They occur because the crystalline lens gradually becomes cloudy, causing blurry or dimmed vision. Many years ago cataracts would eventually lead to sight loss but nowadays a quick procedure can remove the cataract and give you excellent vision. Glaucoma is the name given to a group of eye conditions which cause damage to the optic nerve and can affect your vision. The most common type, chronic glaucoma, occurs slowly, affecting your peripheral vision initially. It may be associated with a raised pressure within the eye. Chronic glaucoma is usually unnoticeable to the patient until the visual field loss becomes very advanced, but regular eye examinations can detect early signs of glaucoma and can result in effective treatment to slow the progress. Acute glaucoma is much less common and is a rapid build up of pressure within the eye, it is very painful and is not likely to go unnoticed. 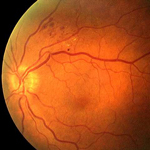 Age-related macular degeneration (AMD) is a condition that affects a small but important part of the retina at the back of your eye called the macula. 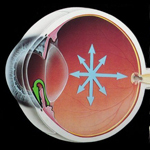 The macula is responsible for your detailed central vision, such as reading. Usually the first problem people notice is with their ability to see fine detail. Some may notice a small blurred area in their vision or see a slight bump or distortion on straight lines. Some AMD can be treated, some cannot. Both type I and II diabetes can affect the eyes in a number of ways. 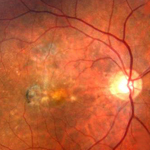 The most serious involves leakage from the blood vessels supplying the retina (Diabetic retinopathy). Most people with diabetes will be on a photographic screening program for this, separate from the annual Optometrist check. People who have diabetes also have a greater likelihood of other eye conditions. Blepharitis refers to inflammation of the eyelids. The natural oils normally secreted by the eyelids build up on the lid surface and the base of the eyelashes resulting in eye irritation and often redness. It’s a common disorder that can be easily managed with the appropriate treatment. Eye irritation, burning, excess tears, foreign body sensations, crusty debris (in the lashes, in the corner of the eyes or on the lids), dryness and red eyelid margins are all possible indicators of blepharitis. Dry eye means that your eyes may not be making enough tears, that the tears which are being produced are of poor quality or that the tears produced evaporate away faster than they should. The normal function of tears is to keep the surface of the eye wet and lubricated, allowing the eyelids to move easily across the eye’s surface, so any shortage of tears or reduction in their quality can produce a gritty, burning sensation of the eyes and can also disturb vision. Dryness, burning, stinging or itching, gritty feeling, excessive irritation from wind or smoke, blurred or smeary vision, tired eyes, red eyes, excessive watering, sensitivity to light, contact lens discomfort.